Here she is my Alberta Canada Block. Before we begin Id lake to give a big THANK YOU to Marian of Seams to be Sew and Amy at Sew Incredibly Crazy without them we would not be able to have this blog hop with all these giveaways. Thanks Girls for all the work you put into organizing this event the 2016 Road Home Row Along. I’ll try my best to explain my design process and the steps I made to get to this finished block. First of there was size specifications that our blocks had to be. I designed mine on EQ7. The size of my block when finished without borders is 12″ x 40″. I choose to do a landscape layout as I was planning on doing a landscape of Alberta Canada. cloudy skies. Only in Alberta can we get all 4 seasons in one day. The next step was how to lay them out. Of course the mountains had to be in the West. then as we head east we would come to the foot hills then fields. This was all done using layers of applique. Now that I had my basic idea what I wanted in my row off to my EQ7 program to design it. This turned out to be also more confusing as I was just learning the program…did I mention I like to challenge myself. I tried drawing the mountains and for some reason they kept erasing when I wanted to go color them. Turns out that all your shapes need to be closed if you want to color them in. Thanks to the help from Marian of Seam to be Sew we got that portion figured out. The rest went well as I knew what I was now doing. With the landscape done I could move on to adding the shapes. My next step was to do the shapes for the pump jacks, horse, pine trees, and rose. this I had to do into my applique section of the EQ program. I found the pump jacks to be quite challenging again my shapes were not closed. The pine trees were an afterthought so they were added into the design later in the process. She was coming together. now all I had to do was copy paste and resize the elements. and color them in. Whoop hoop…. I was finished the block design. now all I had to do was print it out and start assembling it. Again this sounded easy but when I first started for some reason the block size was not set to what I wanted and my mountains when I cut out the fabric were all squished as i was working with a 12×20 block not 12×40 block. And I had forgotten to reverse my templates. I sewed the sky fabric to the bottom what ever scrap I had on hand to make a foundation to mount the rest of the elements on. Traced out all the shapes that was needed onto fusible web I like to use Heat n Bond. Starting with the mountains that were in the rear and then assembling towards the front. I layered and pinned everything into place and then ironed it town to get the heat n bond to stick. Same thing was done with the foreground shapes. then all I had to do was run a satin stitch around all of my shapes. I hope you enjoy and please show off your finished project. Don’t forget to check out the rest of the blocks offered free to all in this blog hop . These are the blogs being released.debuted this week. Go to the schedule for links. I’m having issues with the Giveaways please go to the Seams to be Sew Blog to Enter. Next Paper piecing….It all started with a clock. Very cool row. You can tell you puta lot of time into it. Thanks so much! Oooh! Horses! I love it! Thanks for the giveaway opportunity! no problem. I love horses too. Very nice row, love the horses. Thanks! Thank you, Renee, for the pattern to your row. I’m glad you explained about working from the back to the front. Raw-edged applique by fusing is an excellent idea. I’m sure, with practice, you’ll get better and better with EQ. It’s fun trying to guess the locations by looking at the different rows. You did a wonderful job on yours. Thank you. I suppose it could be anywhere along the rocky mountains in the us also. A beautiful row! It reminds me of my own love of the intermountain west. Thank you for your design. Wonderful Row, thanks so much. Very nice Road Home quilt a long. I have horses and live in the country too!! Your row is beautiful! Love it! Great row, Renee! I live in the mountains, so I’m partial to those pine trees! I love the wild roses, too! First time entering a “blog”. And a quilting blog seems to fit me perfectly. Can’t wait to continue and not knowing how. Watch me me jpgb…. this was my 1st time I joined the road home row along before I even had a blog. lol so we are all on learning curves. Very pretty row, I like how you showed photos of it all coming together! All I saw was the pattern at the beginning of this post and my first thought was “Gee that really looks like Alberta.” And then I scrolled down to find that I was indeed correct in my assumption. Too bad all the giveaways are for US residents only. I Know the lady who hosts it is from Italy and she cant participate. I think the reasoning is that the sponsors don’t want to ship out of country. We’ve been to several parts of Canada and love them all! The people and scenery are the best! Thank you Kathy I’m proud to be Canadian. seems to me we are all friendly and the wide open spaces not cluttered by citys. This reminds me of Montana. I have been up in Alberta, it is a very lovely place. how difereint is montana then alberta are the mountains as high? You put a lot of work into this beautiful row! It really was not that much. fabric selection was the hardest. Thank you for your tutorial. Love your row! Beautiful row. You put so much detail into it. What a beautiful place to live; you captured it in your row! Well done. So great to see an Alberta entry! Thank you Debra I appreciate it. My favorite row for today. I love mountains, trees and horses. I like that we can learn about all these places and collect all these rows without the need to travel! Thank you for a beautiful row! I’ve been to Canada and out west and I didn’t know how to express it, you did it for me. Love it. Thank you is sure is memorable isn’t it. Love the mountains in your row! Thank you the material I chose sure made them look realistic. Love your row. So glad that you joined us on this hop. I love your row. 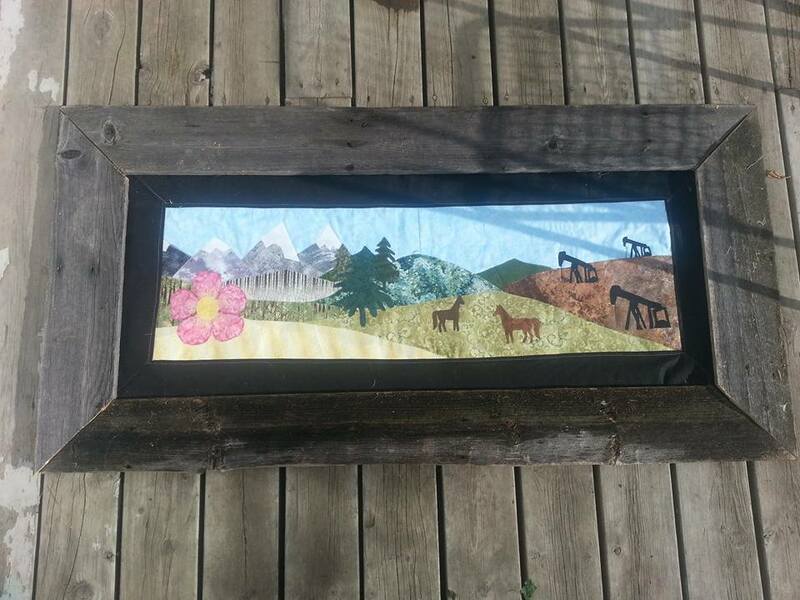 The oil wells and hills remind me of Oklahoma and the mountains….Colorado. Wonderful row! Beautiful Row!! Very creative & details are Awesome! Thank you for sharing HOW you designed your awesome block, I’m new to EQ7 so this was super informative. your quite welcome. I really enjoy sharing what ive learned. the way I see it someone tought me now its my turn. thanks Maggie hope you enjoy it. I really like that you listed the steps you used to assemble your block. Your “home” looks like a lovely place! thanks. I’m glad you enjoued it. Thanks for the great row! I live in Calgary, so I’ll be making this one for sure. Thank you. I hope you have fun making it. What beautiful and meaningful art! Thanks so much for the detailed explanation of how you put your row together. This is inspiring me to try a block like this. thank you. hope you enjoy making if if you do. I love your row. Thanks for sharing. Very nice row. I love the applique. Thanks and your welcome. the giveaways were marian from Seams to sews doing. I love your row, it really depicts your part of our beautiful country. Well done. thanks Rhonda. your totally correct I do feel like I live in a beautiful part of Canada. your row is so beautiful. I shared it.